I don't use the PrtSc button. Windows has a nice snipping tool you can use. I have it pinned to the desktop which is really convenient. The forums have their own image hosting service as you can see in the screenshot. Click the button that the arrow points to. The image you saved from earlier needs to be uploaded, so you find it on your computer or simply drag it to the box here and press send. After the image has been uploaded a link like this should come out. Copy the first one and paste it into the comment box. tags in the beginning and end of link as shown in screenshot below. Just as a little extra info, I use a 3rd party program for this. 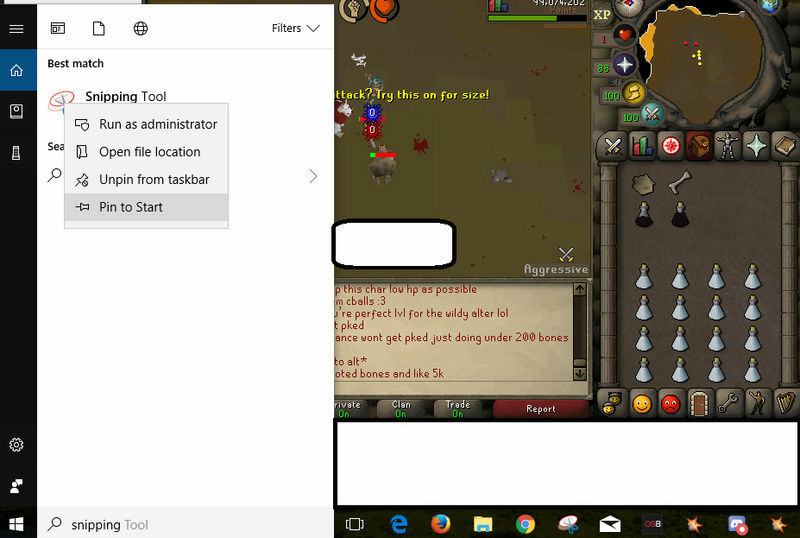 It's called puush and lets you take screenshots which are uploaded automatically, also lets you select an area on the desktop to screenshot. It's possible that they have stopped accepting new sign-ons though, lemme know if that is the case and I will remove this reply. Thank you auto! i always wondered how to do this but never looked into it. i'll post a screenshot if i ever get my fire cape. A bit late for a response but thanks very much Auto! It took me a bit to set up (not that computer savvy) but I finally got it pinned to my task bar.